His Excellency Sergey K. Ovsyannikov, Consul General of the Russian Federation in New York, and His Grace John, Bishop of Naro-Fominsk, Administrator of the Russian Orthodox Patriarchal Parishes in the USA, cohosted a traditional Paschal Reception at the Russian Consulate in New York on Thursday, April 18, 2018. This annual reception is held at Eastertide for members of the Orthodox Consular Corps, Orthodox Hierarchs and distinguished members of the Russian Community. Representing the Serbian Orthodox Church was His Grace Bishop Irinej of Eastern America. Her Excellency Mirjana Zivkovic, Consul General of the Republic of Serbia, represented the Serbian Nation. Thus manifesting the traditional ties between the Russian and Serbian Churches, Nations and peoples, that share the same faith and Slavic blood and language. Following welcome addresses and Paschal greetings by the representatives of the Russian State and Church, the Resurrectional troparion was joyously sung by all present as a bountiful and well laden festal table was blessed for the enjoyment of those in attendance. The Consulate General of the Russian Federation, formerly the John Henry Hammond House, and the adjacent Burden House, now part of the Convent of the Sacred Heart, were built by Emily Vanderbilt Sloane and her husband, William D. Sloane, as gifts to their married daughters. 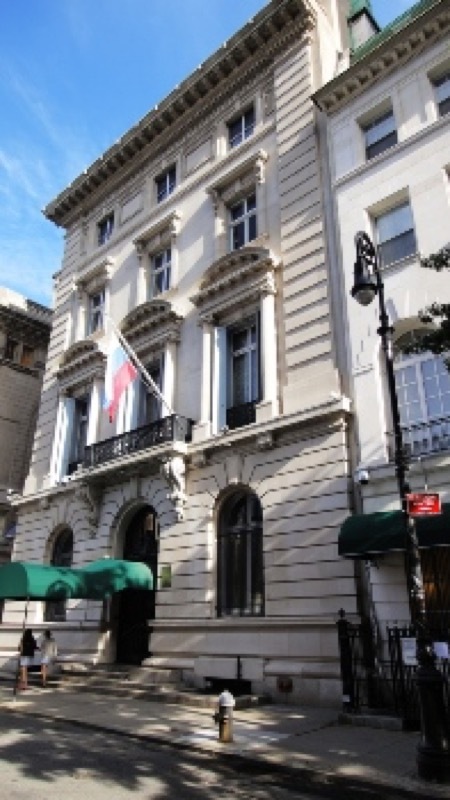 Among the grandest private residences in the City, the two houses were constructed between 1902 and 1905.